Participants are protesting gun violence, one month to the day after a deadly school shooting in Florida. At 10 a.m. Wednesday, March 14, students across the region stood up, walked to the door and left their classrooms in a protest against gun violence. 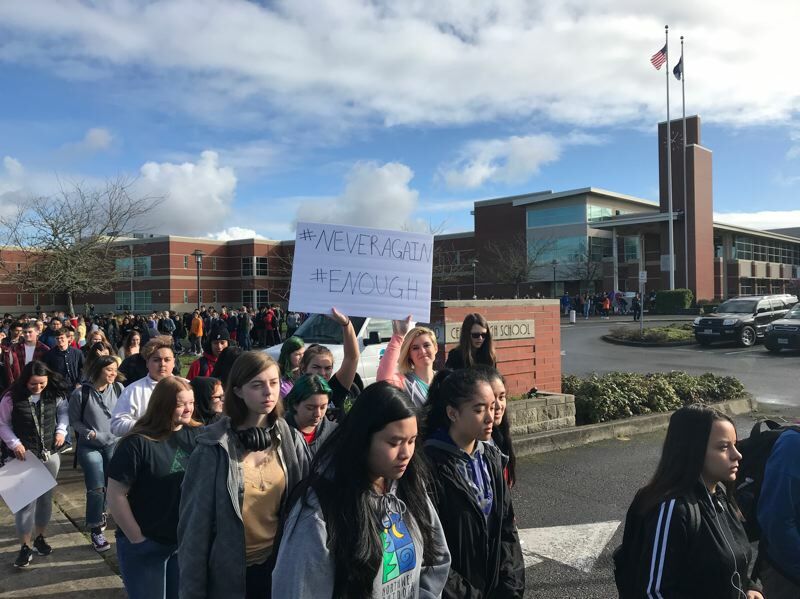 Walkouts were planned across the Hillsboro School District at all four public high schools and several other schools, including multiple elementary schools, according to Hillsboro schools spokeswoman Beth Graser. 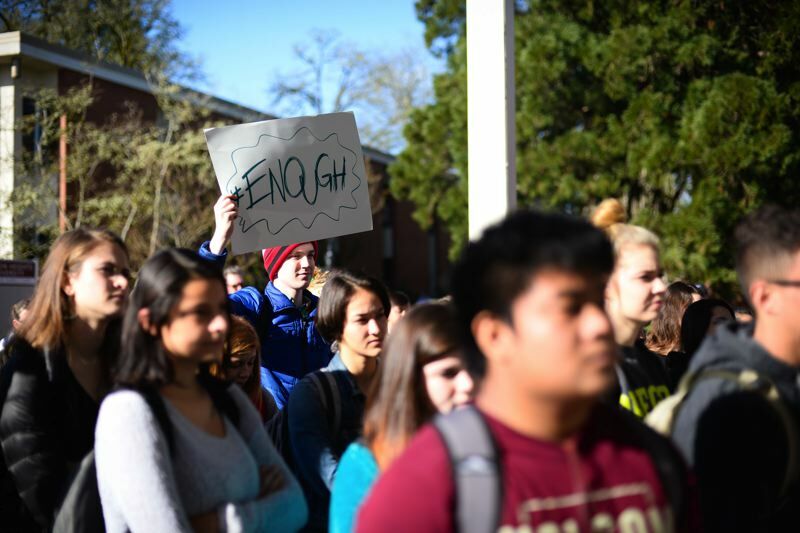 Students at Forest Grove schools and Pacific University in Forest Grove also walked out as part of the same protest. Wednesday's walkouts come one month after a Feb. 14 school shooting at Marjory Stoneman Douglas High School in Parkland, Fla., that left 17 dead. A former student at the school, 19-year-old Nikolas Cruz, was arrested and has been charged in the case. One woman who came out to support students at Century High School, Nicole Odom, said she graduated from Stoneman Douglas High in 1997. She now teaches kindergarten in Beaverton. "Tell your daughter an alumni says 'thank you' for being brave today," she told a supportive parent outside Century Wednesday. At Century, a few hundred students marched out of class and around the building to show their support for the students in Florida. 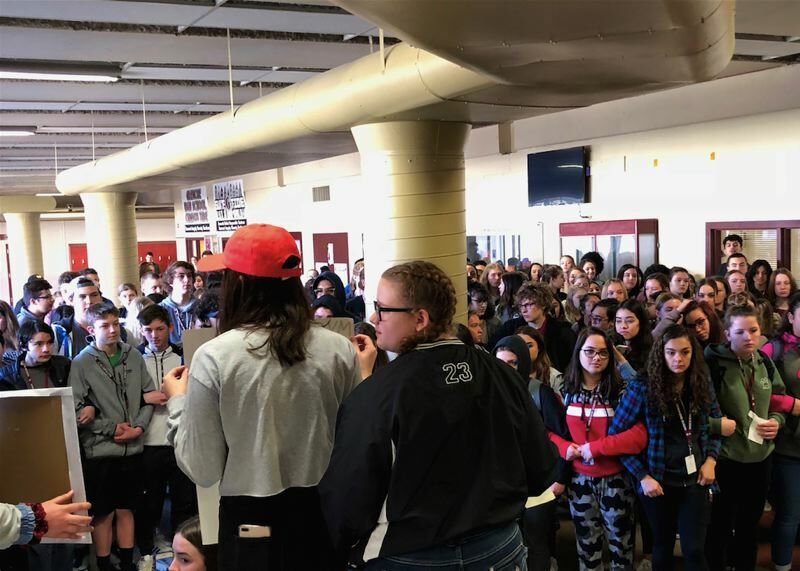 Glencoe High School held a 17-minute long moment of silence, one minute for each of the 17 people killed in the Feb. 14 shooting. "It means a lot. It spreads the message," said Odom of the student protests. "For a lot of kids, seeing it on television doesn't quite hit home, but something like this it brings the awareness up." Odom's family still lives in Parkland, she said. She said she felt it was important to show her support for students. "It's hard to get up the nerve to stand up and walk out of class," said Odom. A spokesman for the Forest Grove School District said Monday that the district would consider students who walked out to have an unexcused absence from class, but that they would not face further punishment. Senior Brennen Young said he wasn't fazed by the idea of recrimination anyway. "Students were scared that we would get detention or disciplinary actions, but I was gonna do it either way," Young said. "Even if I was the only one, I was still going to do it to pay respect to the students and have a peaceful protest (against) gun violence." 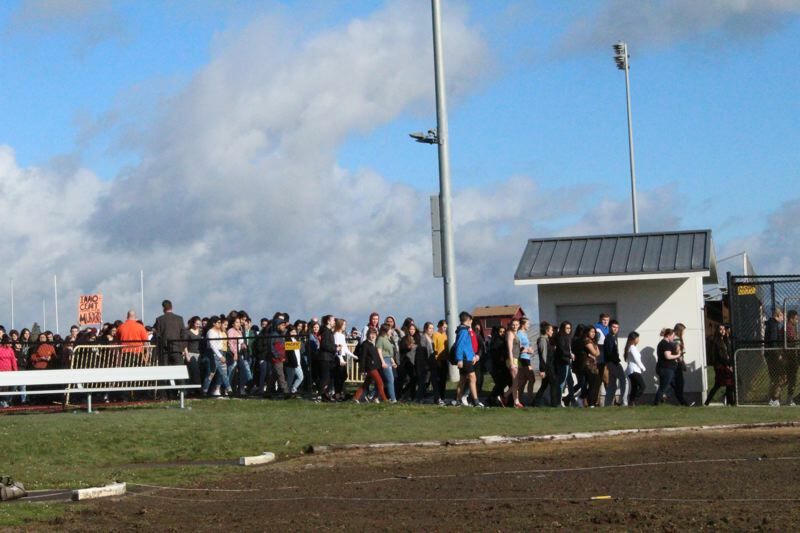 Forest Grove High students walked out to the football field. "It was a powerful experience," said senior Adrian Gutierrez. 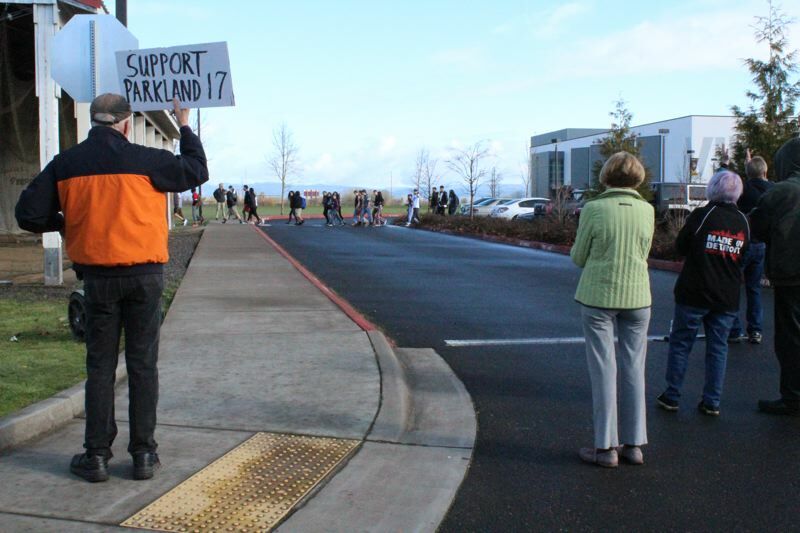 Students at the Forest Grove High protest "were honoring and mourning the 17 people who died" in Parkland, Gutierrez added. Some members of Pacific's administration and faculty came out to the student walkout on the private university's campus, which brought hundreds of students to the pavilion area in front of the Washburne University Center. 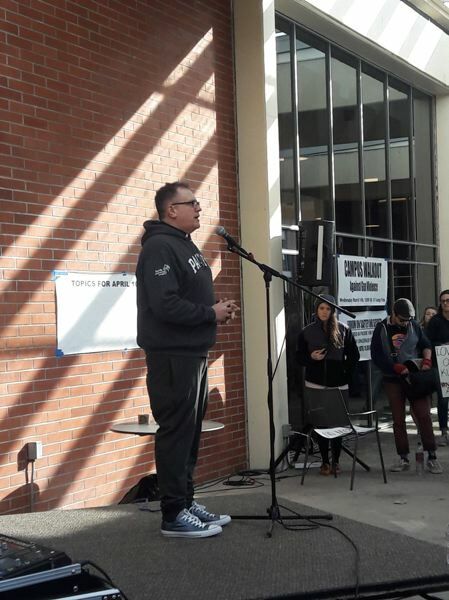 "We encourage expression and discourse from all points of view in a safe space, and also respectful space," said Joe Lang, a university spokesman, explaining Pacific's stance on the walkout. Katie Lightcap, president of Pacific's undergraduate student senate, addressed the crowd, as did sociology professor and Pacific alumna Jaye Cee Whitehead and university chaplain Chuck Currie. Walkouts at schools across the country Wednesday were coordinated nationally by EMPOWER, the youth wing of the Women's March. The goal of the #ENOUGH protest is to demand state and federal action to prevent gun violence. On the same day as the walkouts, the U.S. House of Representatives passed a bill to increase funding for the federal "Secure Our Schools" program, which provides training grants for law enforcement, school staff and students to prevent violence. The bill, sponsored by Florida Republican Rep. Ron Rutherford, is called the STOP School Violence Act. It has the support of Trump and the National Rifle Association and appears likely to sail through Congress. Rep. Suzanne Bonamici, a Democrat who represents northwestern Oregon, said the bill is "a modest first step, but we must do more." "Every day in our country, people lose their lives to gun violence," Bonamici said in a statement after voting in favor of the STOP School Violence Act. "Congress must come together to answer the call of the vast majority of Americans for stronger, universal background checks and for stopping dangerous individuals from getting guns." Leaders of the youth movement that has arisen since the Parkland shooting last month have called for more stringent gun control measures, including a ban on so-called "assault-style rifles" like the semi-automatic AR-15 used at Stoneman Douglas High and in many other mass shootings in the United States. The Florida Legislature voted down such a ban days after the Parkland shooting, and similar proposals at the federal level appear to have no chance of passing in the Republican-controlled Congress and receiving Trump's presidential signature. Organizers have used political inaction on gun control measures as a call to action. The Rev. 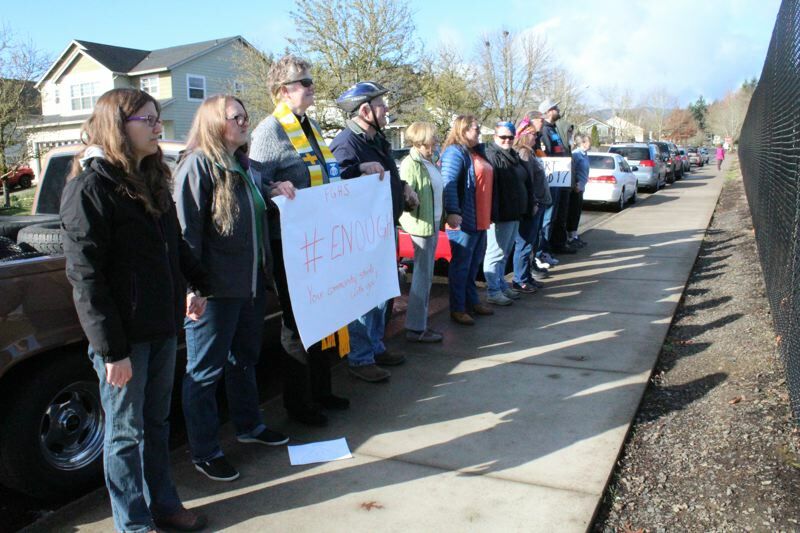 Jennifer Yocum, who preaches at the Forest Grove United Church of Christ, said she and others came out to support students rallying at Forest Grove High because they "really want to see an end to the fear that students and staff and faculty are facing whenever they go to school." Yocum said, "We want to create a change that is focused on saying that the world is in fact a beautiful and hopeful place to live in, and let's say 'enough' to giving in to violence and fear." 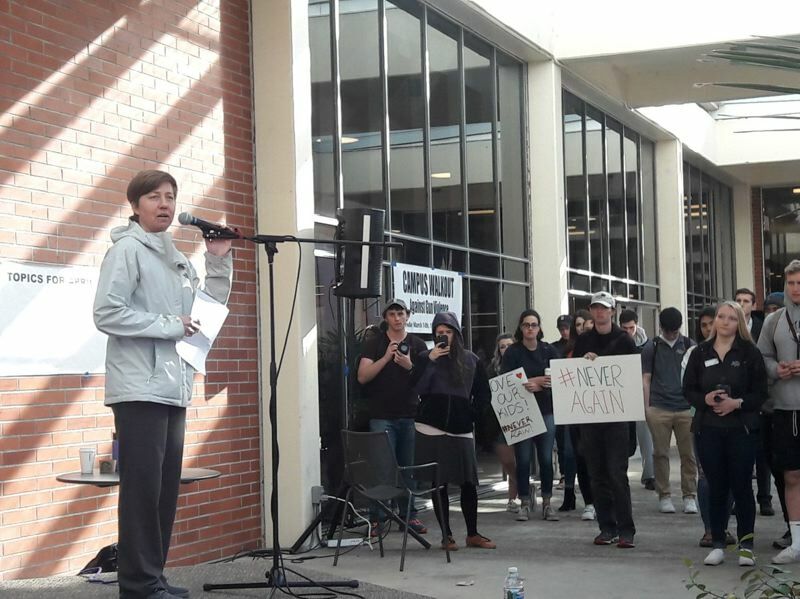 In a passionate and politically charged speech to the crowd at Pacific, Currie urged students to get organized and register to vote in order to "make a difference come this November." "If we stand by, if we are silent, we are complicit — just as complicit as those who would put gun manufacturers and bullet manufacturers over the safety of children in schools, over the safety of those worshiping in our churches and our mosques and our synagogues, over the safety of those who are shopping at our malls," said Currie, who is the director of the Pacific University Center for Peace and Spirituality and estimates he has been involved in the peace movement for about 30 years. "We can make a difference. Enough is enough is enough." Currie specifically called out a federal rules change signed into law by President Donald Trump — whose name elicited scattered hisses from the students — last year that removes some people with identified mental health issues from the national background check database. "That is the wrong path for our country," Currie declared. "There is a right path, and that is the wrong path for our country." Lightcap said she began researching and organizing after the Parkland shooting, with student leaders ultimately deciding to join a "national movement" in Wednesday's rallies across the country. "It's not on the news anymore, and we're trying to bring it back," Lightcap said. According to career and college counselor Vicki VanLoo, 494 students at Forest Grove High — a little more than a quarter of the student body — participated in the walkout. "I was very pleasantly surprised by how many people walked out with us," said Young, the Forest Grove senior. But a 17-minute walkout, Young added, is "not long enough to get the message out for what needs to change, and how it has affected us." Even still, he said, "I was glad that it happened." 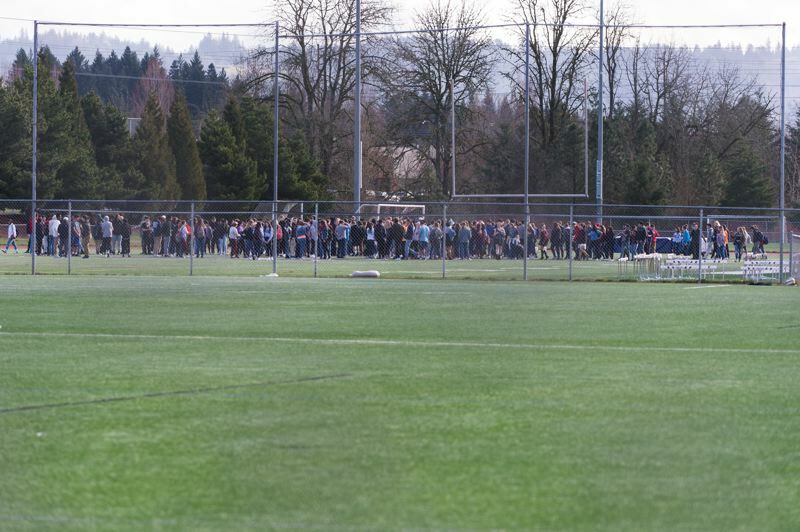 Forest Grove High was not the only Forest Grove school with a walkout. VanLoo said about half of students at Neil Armstrong Middle School walked out, too, as did about 20 students at Tom McCall Upper Elementary School. Graser, the Hillsboro schools spokeswoman, said about one-third of district schools in all participated. 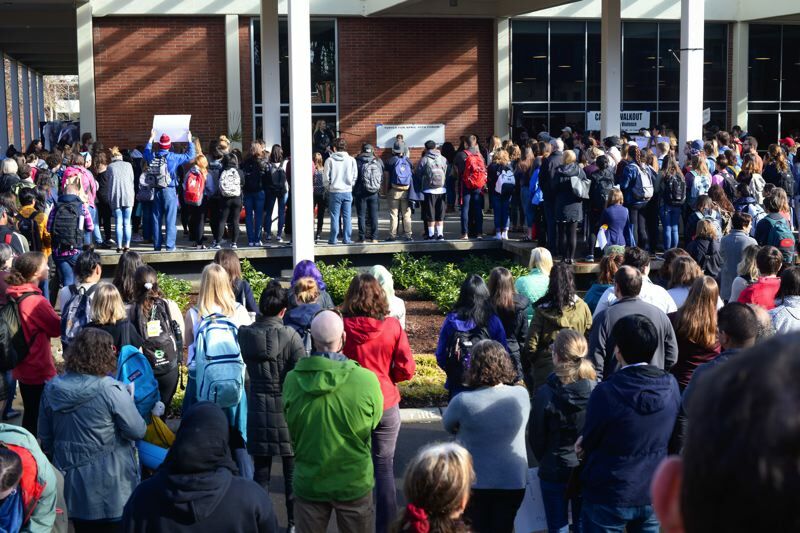 Hundreds of students at all four high schools — Century, Glencoe, Hillsboro and Liberty — and at least two middle schools — Evergreen and R.A. Brown — walked out, Graser said. As it happened, participating high-schoolers in Hillsboro won't even get an unexcused absence for walking out of class, according to Graser. "We did not take attendance during the walkout," Graser wrote in an email Wednesday afternoon. "Attendance was taken as normal this morning, and then the plan was for teachers to take attendance again after the walkout to see if anyone didn't return to class. For the high schools, the timing worked out such that students were back in school in time to get to second period, so those teachers would have just taken attendance as normal." Elona Wilson, vice president in student leadership at Pacific, was pleased by the large turnout on her campus for the event. "I think that it's safe to say that Pacific has come out and said that we have had enough," Wilson said. "We are done with lives being taken for absolutely no reason. And I'm really, really proud to call myself a Boxer." Editor's note: This is a developing story. It has been updated with additional quotes and information and will continue to be updated with more details. Photos credited to Pacific University have also been updated with the name of the photographer, Tanner Boyle.